I just received my labels from Wayne Gelardi at Ad Services Unlimited. These labels will be placed on phone hardware that we install. It gives clients a quick and easy way to get the information they need to contact us. This shows Friends of Kevin at work. I met Wayne at an Friends of Kevin event. Please post how Friends of Kevin is working for your members. Dennis Sweeney First Acces Technologies. organizations, is not just beneficial to us, but the community in large! Kevin has been a huge help to the networking needs of CLASS, Inc. As a non-profit, it feels that many times you are ignored when you join a new networking group, but not with Kevin. Kevin has gone out of his way to be a great asset, and has turned into a great friend. I highly recommend joining the Friend's of Kevin group, and finding out how to expand your business network!" I enjoyed your presentation today @ the Littleton library. The most positive thing that is happening because of the state of our economy is the fact that people are reaching out to help each other. With so many people unemployed, it's encouraging to talk with people who are giving their all to help people make connections and find jobs. Thanks for being one of those people who care and are passionate about it, as well. "It has been my pleasure to get to know Kevin Willett. I’ve attended his business networking events and corresponded with him on other occasions. What strikes me about Kevin is his sincere regard for small business owners and jobseekers. Kevin shows a knack for bringing people together to network with the purpose of building relationships. He understands the true meaning of networking, and he has shown a willingness to help others in need. I wasn’t asked to write this recommendation, but after being at one of Kevin’s networking functions, I felt the urge to share with folks how Kevin has impressed me with his dedication, professionalism, and warmth. Last night’s networking event was held at the Lowell Salvation Army, an organization near and dear to Kevin’s heart. He shared with me how he and his recruits ring the bell for the Salvation Army during the Holiday Seasons. He’s convinced me to join him this December. We need more people like Kevin Willett to help business owners and jobseekers through these challenging times. I have attended several Friends Of Kevin events, not as a business owner, but as a job seeker. What impressed me most was that Kevin made it a point of knowing who I wasand why I was there when I attended my first event. I was immediately made to feel comfortable walking into the group. Everyone in the group was warm and personable. The best part of the event for me was Kevin asking if anyone in the group was job searching. He knew I was and asked me to speak to the group telling them what kind of employment I was looking for. From that first meeting I made some really great business contacts and even got a job interview from it. Thank you Kevin for allowing business owners to promote their business, and for job seekers to promote themselves. 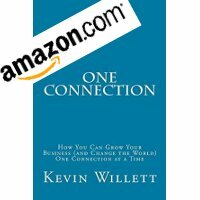 I have known Kevin Willett for over 6 years now and he has always strived to connect people in business and in the nonprofit segment of the business world. Since starting Friends of Kevin he continues to find new connection to introduce to his ever growing group of friends. I attend as many of the events as possible and joined his web site! It is an honor to be a friend! At every event I meet new people and get to connect with some I have met at past events. By attending networking events regularly you will find your business increase because you will be fresh on the minds of the people you see when opportunities presents itself. Thank you Kevin for continuing to find new venues and connections for your friends! You are helping everyone! At my first "Friends of Kevin Networking Event" I met some very interesting people from the Lowell Area. After sharing my story regarding my journey of writing the definitive 50 year history of the New England Patriots I set up a book signing event at a local business in downtown Lowell. Please join us at the Welles Emporium, on 175 Middlesex Street, on Friday Nite, February 11th, from 7-9 pm, for a Pre-Valentine's Day "Total Patriots" Book Signing Event.